New meditation classes starting week beginning April 8th to May 23rd 2019. We should ask ourself what we consider the most important thing in life. For some people it is possessions, for some it is reputation, for some power & for some relationships with their family. All these things can give us temporary happiness but cannot give us the deep lasting happiness we all want. This can only come from developing our mind to its fullest potential. On this day course learning how to develop develop the mind and fulfil it’s true potential. The teacher of this day course is Gen Kelsang Chokyong – Chokyong has been the resident teacher at Odiyana Kadampa Meditation Centre for 15 years. He teaches with great humility and humour. He presents Buddha’s teachings in a practical and down to earth manner, making them accessible to everyone. White Tara is a female enlightened being. Her function is to bestow long life, wisdom and good fortune. Through receiving the blessings of Venerable White Tara we will be free from untimely death, we will attain great good fortune and profound wisdom. Through this we will attain enlightenment quickly. This empowerment is an opportunity to make a strong connection with White Tara and receive her powerful blessings. The Empowerment starts at 10am and runs until about 5pm. The cost is £25 per person which includes lunch and refreshments throughout the day. Our past can feel like a millstone around our neck, holding us back in so many ways. On this course learn to let go of all the anger, attachment & resentment that is preventing us from finding lasting happiness freedom from problems. Julie is the Education Programme Co-ordinator for Odiyana Centre. Julie is a very powerful teacher whose practical approach makes the teachings accessible to everyone. We fear many things; losing our money, our friends, our reputation. Buddha said that the only thing we need to fear is an uncontrolled mind. If a wild elephant was let loose in a populated area it would cause massive destruction but an uncontrolled mind can cause much more harm. The creator of all our sufferings is an uncontrolled mind. Kadam John McBretney is the Resident Teacher of Heruka Kadampa Meditation Centre. 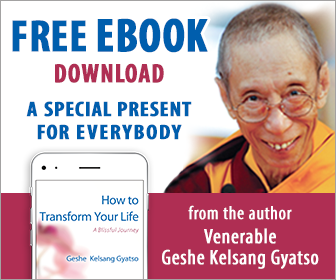 He has studied and practised Kadampa Buddhism for many years under the guidance of Venerable Geshe Kelsang Gyatso. Kadam John explains how to use Buddha’s teachings to solve our daily problems and find real happiness.